This multifunctional wireless cycling computer with 11 functions can track your riding distance, time, speed. It is really a useful cycling computer to meet your various needs. 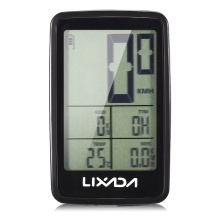 7 Functions: Wireless bicycle computer displays Riding speed/time/distance, Average/Maximum speed, Total riding distance, Temperature. USB Rechargeable: 120mAh lithium battery takes only 1 hour to full charge, and lasts for 12 hours with backlight on, up to 2 months standby with backlight off. Convenient: 2 smart buttons for easy operation. Small size, lightweight and wireless design makes it more convenient.